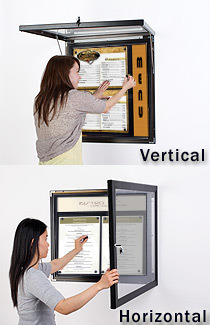 These Outdoor Menu Cases Are Designed for Used Outdoor. The Unit Is Safe for Use under Any Types of Weather Conditions. 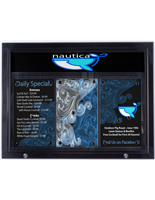 Use These Menu Cases to Display All The Important Messages. Common Size: 27" x 27"
16" x 27" 24" x 31"
27" x 38" 31" x 32"
Lockable swinging door to protect postings from being vandalized. 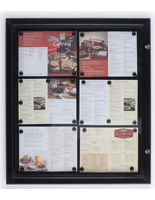 Interior magnetic board for displaying (2) 11" x 17" pages [magnets included]. 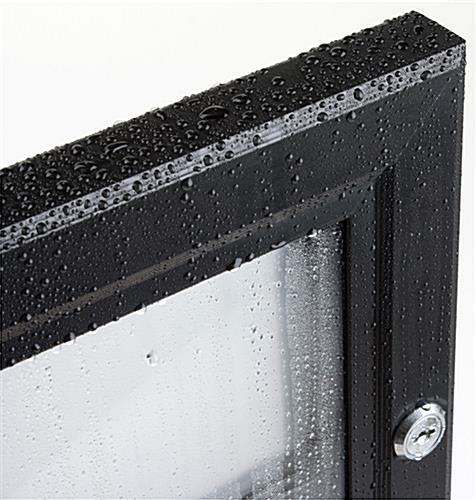 Weather resistant, aluminum frame with rubber gasket seals out moisture. 23-3/4" x 5"h header area for displaying attention grabbing caption. 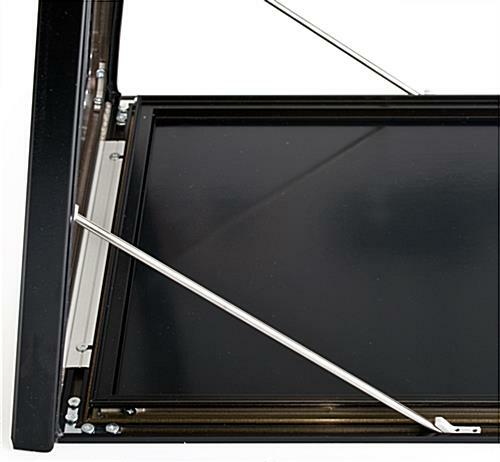 Polycarbonate lens is extraordinarily durable to protect 23-1/2" x 23-1/4" viewing area. 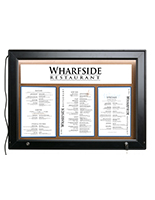 These notice holders, outdoor menu cases are an excellent way to communicate announcements and upcoming events to the public. Each unit comes with a spacious 17-1/2" x 23-1/2" interior magnetic board to hold (2) 11" x 17" pages. 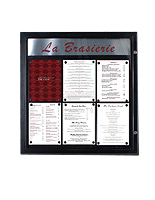 Unlike other corkboards and fabric boards, these wall-mount outdoor menu cases are so much easier to use, allowing users to make the changes within seconds. Magnets are included with the frame. 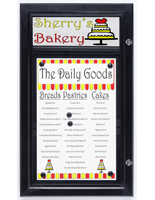 These outdoor menu cases that have an interior magnetic surface are an easy way to post messages. The swinging frame also comes with a header space at the top for placing additional messages. 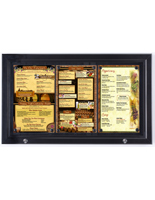 These outdoor menu cases, also known as bulletin boards, have a top area that accommodates 23-3/4" x 5" custom-made caption. There will be no header included with these notice holders. Users are required to prepare their own headlines. Create an attention grabbing message or company logo and insert in the header area to increase advertisement exposure. 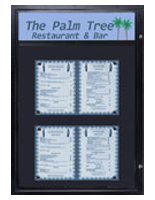 These outdoor menu cases that have a sleek black finish can be used in many businesses to show upcoming events, food listings, current promotional sales or important notices. Each swing-open frame comes with a swing-open door for easy access. Graphics can be made directly from the front without having to detach the unit. The swinging frame has a rubber gasket sealed around the interior of the door to keep the moisture out. These bulletin boards, outdoor menu cases that are weather-resistant are meant for used outside the facility. This can broaden the targeted market and ultimately expose your advertisements to walk-by customers. By mounting these bulletin boards outside, it helps to extend the advertisements and notices to capture new or potential customers even after business hours. 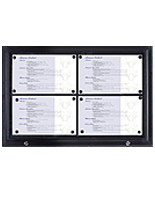 Even though, these notice holders are designed for exterior use, they can also be mounted in any interior environment. 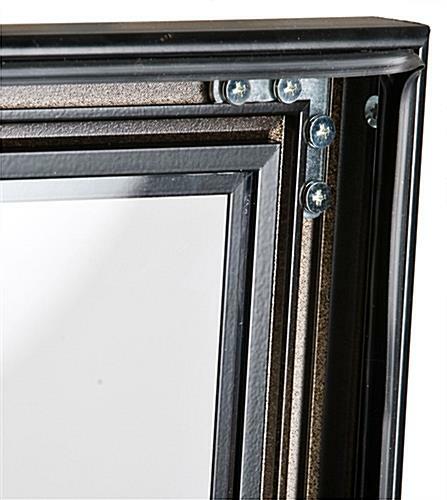 All the wall-frames come with built-in lock and a set of keys to prevent unauthorized access. This swinging frame can be installed in two different ways; vertically or horizontally. 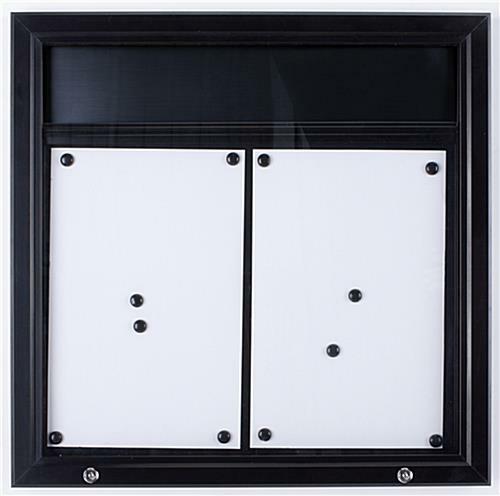 All the wall anchors and screws will also be provided together with the unit for easy installation. Click here to view wall-mounting instructions. 27.1" x 26.9" x 1.3"